Voila! 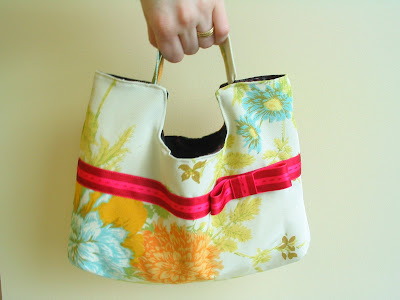 The charming handbag (wonderful pattern from angry chicken's book, Bend the Rules Sewing). This will be winging it's way tonight to my eldest sister, the other culprit involved in sending me such a sweet package. Believe it or not, I made this in one evening - last night. It was so fun! I love love LOVE this pattern. 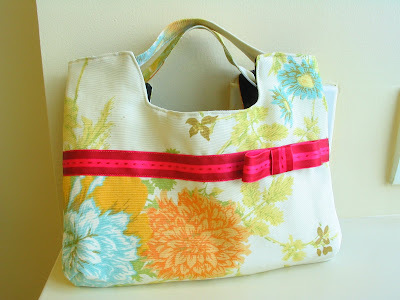 Amy put the instructions for this together in such a great way, it was a pleasure from start to finish. I used thrifted material for the outside - it's not cotton, but a kind of slick, sturdy material. I think it used to be a curtain. The ribbon comes from a box of Godiva chocolates my hubby gave me for Valentine's day (man I love that ribbon), and the lining was a gift from my mom-in-law. I had this fabric all picked out a week or more ago, as soon as I saw the ribbon on it that is. It's very bold and funky, but then so is my dear sister! I hope she loves it. I carried it around work to take photos in a nearby empty conference room (where I nearly dislocated my shoulder taking that first picture), and it actually is very ergonomic. I believe I shall make one for myself one of these days. 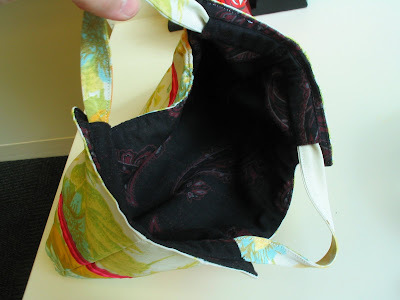 Here's the inside - I actually think it's mysterious and cool that it's such a contrast to the outside fabric. Here's hoping it really is, and not just my weird opinion. 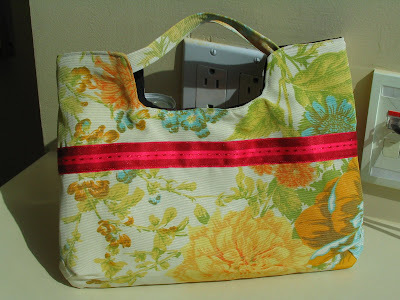 I decided to continue the ribbon around the back - I much prefer things like purses to be consistent on both sides, especially with something as dramatic as very RED ribbon on cream fabric. All in all I'm really happy with how this turned out. I hope my sister is too!